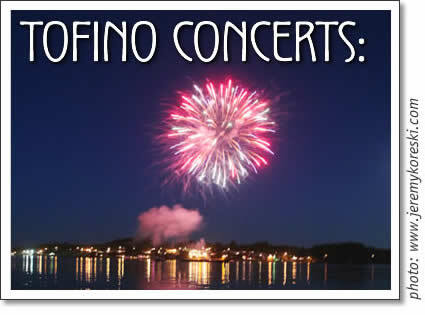 The following concerts are happening in Tofino in the month of July 2006. Tickets are available at Tofitian, Esso and at the Common Loaf. Canada's preeminent power trio, No Means No have been abrading delicate ears with their complex rhythm-heavy funk-punk and promulgating leftist social commentary across North America since 1981. That was the year a couple of nice Canadian boys, brothers John and Rob Wright, formally began their strange sonic experiments that fused punk with blues, jazz, funk, metal, and pure noise. Rhythms and declamatory lyrics dominated their sound, a situation that remains true today after two decades of developing their sound. Melding the sound and instrumentation of funk fusion with the irresistible drive of house, this house-rocking seven-piece band includes guitar, bass, turntables, vintage keyboards, drums, horns and percussion - creating a sound that any one can dance or bob their heads to. The music appeals to a diverse audience, everyone from the discerning listener to those who just want to move to the groove. One of Canada's premier touring bands, the group's self-titled debut album has sold over 2600 independent units. Mexico City has been skanking to the cool- mestizo- reggae rhythms of the Rastrillos since 1988, grooving to their joys and pains, following their musical quest for basic human values — friendship, respect and love. Rastrillos music is a fusion of mexican popular music, with the root of reggae mixed with a taste of the jazz, funk, indu and ska traditional. The Rastrillos' songs talk about all they have experienced during this long voyage guided by the four winds. They have shared the stage with internationally renowned groups, and with the best the Mexican musical scene has to offer. There is a pocket of groove reverberating out of Vancouver's Eastside. Anything goes, from punk to funk, live to sample, structure to stream. Freeflow has been distributing its brand of funk, soul, brother for the past 5 years, most recently expanding it's influence to the North American stage. An eclectic collective, Freeflow masterfully blends soul, hip-hop and rock. This is music for and of the people. Performance is a key element of the Freeflow experience and with the release of their first CD, Barfly Sessions, its become dancing room only at Vancouver's larger live venues. As Mark Bignell from CFRO 102.7fm, Radio Bandcouver, put it, "to miss them live is to grossly cheat yourself of easily one of the best live bands [that] Vancouver has to offer." If you know reggae music, you know Clinton 'Basie' Fearon. Clinton Fearon is counted among Jamaica's most talented musicians by peers and professionals in the Reggae music industry. His infectious bass riffs, guitar licks, percussion accents and powerful vocals make Bassie a living legend amongst reggae musicians and fans. As a youth, Bassie went to Kingston to eventually become the well-known bassist, vocalist and lyricist for The Gladiators as well as a house musician for Coxsonne Dodd's Studio One and Lee "Scratch" Perry's Black Ark Studio. Fearon recorded many of Perry's best known songs, including Roast Fish and Cornbread which features one of Fearon's most famous bass lines. He also composed some everlasting basslines for Yabby You, Jimmy Riley, Max Romeo, Junior Byles and many many others. Since forming Jets Overhead in 2003, this five piece from Victoria, BC has mesmerized crowds at home and abroad with their hypnotic take on trance rock. Having shared the stage with The Stills, The Dandy Warhols, Stars, Our Lady Peace, Tegan and Sara, Powderfinger and 54*40, the self-managed band took time out of their touring schedule last year to record their first full-length, Bridges. The distinctive LP was produced by Neil Osborne, longtime singer from Canadian rock luminaries 54*40, in his first official production role beyond his own bands duties. Bridges was soft-released in late 2005 on a regional basis and has since reached a top 10 position on Canadas national campus radio charts while also being a staple on emerging alternative outlets such as XM satellite radio and 3WK internet radio. The LP is now due for national release on Microgroove/Warner on April 25, 2006. The early momentum of Bridges comes on the heels of the bands debut self-titled EP, which landed Jets Overhead a spot on the 2003 Reach tour in Ireland and the UK, while garnering a #42 peak on the CMJ Core chart in the US. The group released two music videos from the EP, both of which received specialty play on The Wedge, the premiere alternative show on MuchMusic. In September 2004, the video for "Sun Sun Sun" was voted one of the top 20 videos at Indie Music Video Award screenings in Vancouver, Toronto, Seattle and New York. Tofino concert listings for July 2006 from Tofino Time Magazine.